Crisis on the Planet of the Apes may not bring anything new and has its fair share of flaws, but it does a few things well to honor the popular franchise. Since 1963, the Planet of the Apes franchise has become one of the most beloved media franchises within the science fiction genre. With the reboot movies doing exceptionally well, it was only a matter of time until Planet of the Apes made a virtual reality video game based on that continuity. So when I heard the initial announcement that a virtual reality game was being made in the form of Crisis on the Planet of the Apes, it cautiously peaked my interest. I use the term “cautiously” because for two reasons; the first being that many video games based on movies are not very good and the second reason being that I found the concept of the game to be somewhat intriguing. 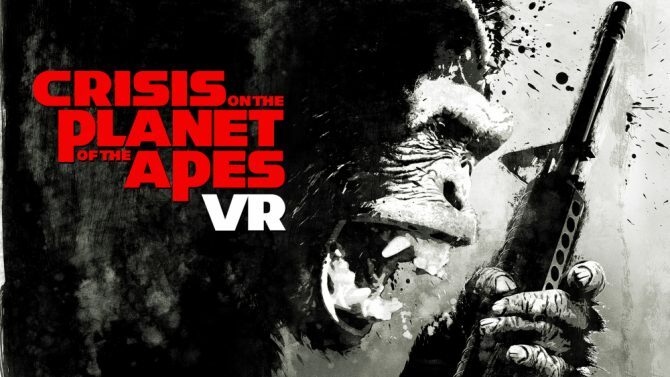 So after spending time with the title, I can say that Crisis on the Planet of the Apes has raised the expectations for virtual reality, but ultimately fails to unleash its full potential. As mentioned in the previous paragraph, Crisis on the Planet of the Apes is set in the reboot franchise. Specifically, it takes place in-between the films Rise of the Planet of the Apes and Dawn of the Planet of the Apes. Players control an ape with advanced intelligence, who has been captured and held prisoner in a remote scientific facility. While the game’s narrative takes place in-between the first two movies in the reboot series, knowledge of both the films is not required to grasp the plot. 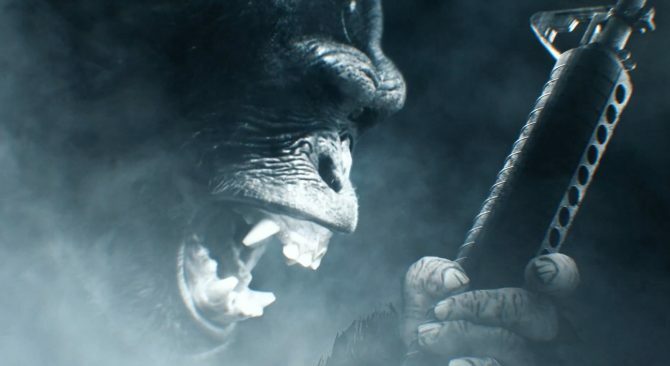 Although the films are not essential to understanding the in-game world, I would highly recommend watching the movie, it provides a more luxurious experience on what is going on in the game and helps players fully immerse themselves into the role of this primate. From my personal experience, I have seen the reboot franchise, and I can say that it makes playing the game all that more enjoyable and much like the reboot series. Crisis on the Planet of the Apes provides a distinct perspective on empathizing with the apes and implementing that with virtual reality technology makes the experience even more enjoyable. Regarding gameplay to progress players will need to swing their arms and mimic movements that bare similarities to how an ape walks using their knuckles. It felt a bit… awkward at first and indeed takes some time to adjust to, but you can adapt quickly and does not hinder the gameplay at all. While the immersion for moving your character is excellent, that immersion can be broken thanks to its on-rail sections very quickly. To me, this feels exceptionally linear, and it demotivates players to explore the environment, and eventually, moving from point A to point B began to feel repetitive very quickly. I understand the goal is to escape the facility, but I could not help but feel there was a missed opportunity to try and provide more lore into the reboot series. Perhaps this is just me though because I am one who likes to find collectibles and interactive items that provide more background on the in-game universe. 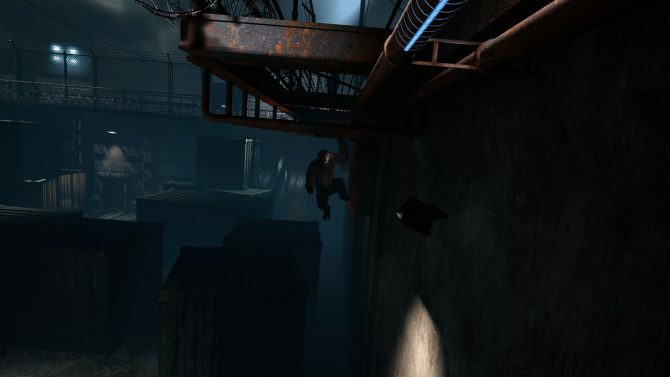 Of course, not all of the game requires walking from one place to another; some portions need you to climb several objects like pipes and ledges, which felt very realistic. Here’s the caveat with that though, if you get motion sickness very easily you’re going to feel queasy during these sections, and unfortunately there is no setting to decrease nausea. Alright, so I know so far this sounds like its a game that requires no combat. However, you would be incorrect. In Crisis on the Planet of the Apes, where you can use firearms to fend off the guards at the research facility. 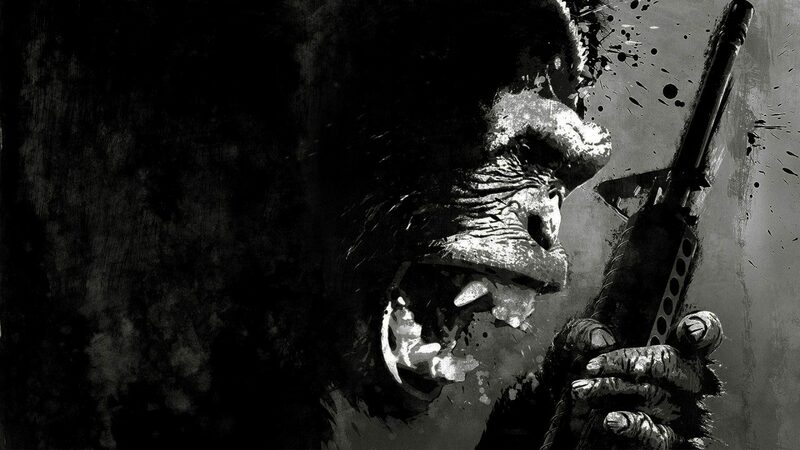 Looking at the overall combat in the game, Crisis on the Planet of the Apes does not offer anything new regarding VR shooting mechanics, but what makes the game’s combat stand out is its cover system. To enable the cover system, you had to grade the edge of an object, any side of the rim will do, and pull yourself around to shield yourself. I found myself utilizing my entire body as I hid from enemy fire and the new cover system made these gunfights a lot more tolerable and less intrusive. While the new cover system is a sweet breath of fresh air for VR shooters, this nice incentive can be overshadowed by redundancy. The first few gunfights felt fun and reminded me of those fast-paced on-rails arcade shooters that had a cover-like mechanic, but towards the end of the game, the lack of variation in enemy patterns and environments felt half-assed. 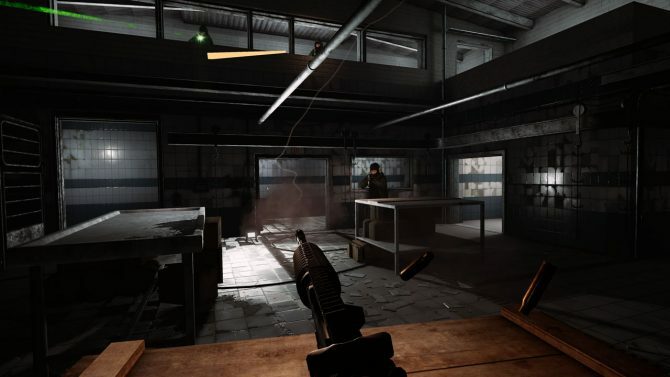 Circling back to new gameplay mechanics, there are a few other new features introduced especially in those stealth sections, but they quickly become disregarded after the introductory tutorials. One instance includes leaping onto an enemy to knock them out, again, this is scripted, and it makes the game feel linear in design, because someone may want to take the stealth approach on the ground and not by climbing. Unfortunately, that is another reason why this game lacks replayability after your first playthrough. It does not help the fact that the game isn’t very long either, lasting only an hour, or in forty minutes if you know what you’re doing. During my time in the game, I felt my eyes beginning to lose a sense of color in my sight. As stated before, the Planet of the Apes franchise is very dark and covers a lot of sensitive topics such as race and animal rights just to name a few. But, that does not excuse the fact that the game does not have a bit more color. Which is disappointing because I felt, there was plenty of opportunities to make the in-game setting more vibrant. Crisis of the Planet of the Apes overall does provide plenty of new things to virtual reality that I can see being implemented in other games within the same genre. Having the chance to put me in the roles of an ape, having the sense of trying to escape from a dangerous situation was a refresher from most VR games as you cannot find another game quite like this right now. Unfortunately, all the new things Crisis of the Planet of the Apes introduced are overlooked when you factor in its short length, repetition, and lack of exploration plague the title. For $14.99 I feel like you are not honestly getting your money’s worth, even if you are a fan of the series. Nevertheless, if I was to recommend this game to anyone I highly suggest picking it up on sale. Currently, Crisis of the Planet of the Apes is available on Steam for $10.04. The PC requirements for FoxNext VR Studio's first title Crisis on the Planet of the Apes have been revealed, this includes the minimum and recommended specs.